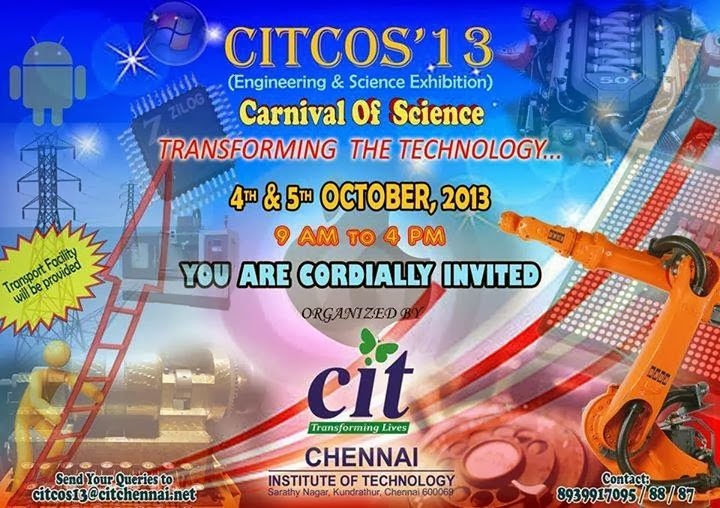 The CIT going to conduct a Science Exhibition “CITCOS-2014” will be held on 4th and 5th of October 2013. 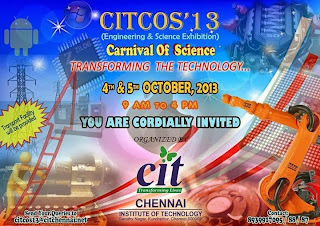 The objective of CITCOS-2014 is to bring together all the 12th Class pursuing students, and make them to understand the basic science, engineering and technological concepts with the help of working experimental models. This exposure will stimulate the zeal among students to develop the passion pursuing engineering education and also to know the scope of various branches of engineering and technology. 2. Participation Certificate for all the participants. 3. Refreshment and Snack will be provided. 4. Short Video presentation on opportunities in higher studies/ Professional courses.